Enjoy walking into your bedroom, seeing it completely furnished with a bedroom set. While decorating the home is quite exciting, it can be very tiring as well. Though there are a few things you can do to make the whole process easier. Instead of picking decor and furnishings one by one, why not get them as a matching set? 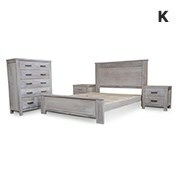 We have beautiful sets that are simply ready to be situated in your bedroom. Within our collection, you can get yourself a set that already has a bed base, two bedside drawers and a dresser in a matching style. That’s all of your furnishings and decor theme sorted in just one move! We offer them at amazingly low prices so that you can easily furnish your bedroom with minimal fuss while making big savings. Having a beautiful bedroom shouldn’t be a hassle. Have a bedroom you will constantly admire. Are you dreading having to pick up, load and unload your order box? There is no need to worry with MyDeal as we will bring your order straight to your doorstep, wherever you are in Australia. If you have any queries about our item range, feel free to call our customer service line or contact us through our online Contact form anytime. We are happy to help.